PORTABLE- With a sturdy frame stand included, this hammock can be utilized anywhere, no trees necessary! 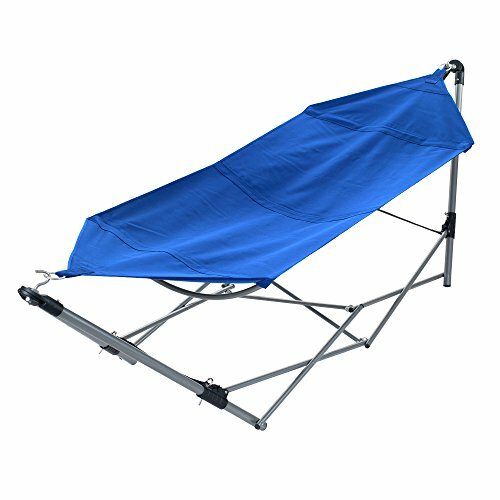 It's perfect for lounging on your porch, backyard patio, deck, or by the pool! CARRYING BAG-The hammock easily folds to fit into the included carrying backpack, making it easy to store and ideal for travel, camping, hiking, or beach trips. DURABLE MATERIAL- Made of durable yet soft canvas, this hammock is both long lasting and comfortable to lie on. EASY ASSEMBLY- This hammock is a snap to assemble! Simply unfold the frame, insert the hooks into the base, then slide the hammock loops over the hooks. PRODUCT DETAILS- Materials: Canvas and Aluminum. Dimensions: Open: (L)97.5" x (W)31.5" x(H)32.25", Folded in Backpack: (L)7.5" x(W)7.5" x (H)44.5", Laying Area: (L)71" x (W)31.5". Weight Capacity: 250lbs. Color: Blue. The Portable Hammock with Stand by Pure Garden is the perfect way to relax no matter where you are! Comfortable and durable, this hammock conveniently folds to fit into the included carrying bag, making it great for travel. Set it up in your backyard on the patio, deck, porch, or poolside, and bring it with you camping, hiking, or to the beach. The canvas hammock comes with a sturdy frame stand, so no trees are necessary for use, simply unfold, set up, and enjoy!